The area south and south-west of Wiener Neustadt is getting progressively alpine. As little as 150 years ago, this was where wilderness started and civilisation ceased. In the late 19th century, however, the Semmering Railway and other railway connections were built and Vienna′s aristocrats discovered the romantic remoteness at their doorstep. Today, the Semmering Railway is not only a UNESCO World Cultural Heritage Site, but also a popular tourist destination with lots of references to its "fin de siecle" heritage. 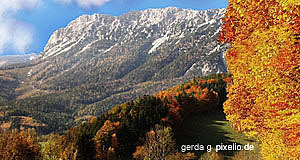 The small town of Puchberg is situated by Lower Austria′s highest mountain range, the Schneeberg area. Since 1897, a "Zahnradbahn" or cog railway starts at Puchberg and grants access to the Hochschneeberg, which is 1796 metres high. The Schneeberg range is among the most popular hiking areas of Austria, mostly due to its accessibility and the vicinity to Vienna. However, there are indeed plenty of hiking routes that reward walkers with great vistas over the border area between Lower Austria and Styria. The even more legendary Semmering Railway was completed in 1854. Its many bridges, arches and tunnels fully justify the area being a World Cultural Heritage Site as a testimony of early industrialisation in Austria (which, as you might have noted, kicked in much later than in England or Germany). Soon after the completion of the railway, several hotels were built along the line, with the town of Semmering itself taking the touristy lead. Ever since that time, the splendour-laden Jugendstil hotel "Panhans" was the most prestigious of the Semmering spa hotels. Within Austria, the Panhans is easily as famous as the Hotel Sacher of Vienna. Pioneering achievements in engineering were continued in the area when Austria′s first cable-car opened in the village of Hirschwang in 1926. The "Raxseilbahn" preceded the rise of the skiing industry by quite a number of years. Until today, it ascends to the Raxalpe, one of the most scenic mountains in the Semmering area. Together with the valley between the Raxalpe and the Schneeberg, the so-called "Höllental" ("Hell Valley"), it ranks among the most scenic and popular hiking areas of Lower Austria. If you decide to have a wee in the woods, it is worth noting that Vienna receives its tap water from the Schneeberg and Rax area. The Semmering Railway finally ends at the Styrian town of Mürzzuschlag. There are very few other attractions nearby, but in case you plan to travel from Vienna to Styria (for example to see the capital Graz), it is worth taking the Semmering route. If you are looking for something to read for the long train-ride: Try to get a copy of Ferdinand von Saar′s novel "The Stonebreakers", which is set in the Semmering and deals with the life and suffering of the labourers during the construction of the railway. There is more on this book in my article on "Reading Austria: Which Books to Choose".